Quick look at a little more data this evening indicates the forecast is in good shape. The next update will be mid-morning today (Wednesday) as there isn't much more to say during the night. There is a threat of severe thunderstorms and damaging winds from the Ozarks to the Gulf. Here is a preliminary look at the treat area. 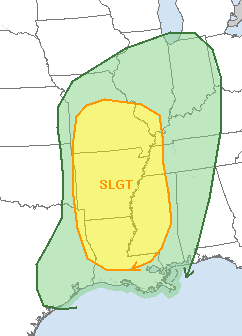 Yellow is "slight" risk, green is non-severe thunderstorms. I'll have more on that later in the day, as well.